Exhaust Gas Temperature (EGT) values, whats normal? So since installing my Exhaust Gas Temperature (EGT) gauge some time ago now I've been prompted to put up a query here, after some chat about turbo's and boost pins etc. I did some reserch into this and pulled up square root of not a lot. EGT's what is "normal" what is excessive and what will melt my turbocharger? - not easy to quantify due to some many veriables, but here's a few numbers below. I looked around for some technical specs for a Garret TB0242 but pretty much drew a blank, anfter doing some digging through technical papers I started seeing numbers around 750-800 degC for the upper temperature sustainable for said size of turbo - so adding some sense to the temperatures, thinking about what materials are involved, that sounds about ball park. From my own truck LR90 200tdi 150k on the clock, quite a well used engine but has a ported head, ali sports intercooler, boost sits about 8 bar, boost compansator has had the spacer removed and the pin has been tweeked. Values of course are effected by outside air temperature (deg C) but, I usually get value as per following. Mega steep hill foot down, I wussed out at 720 degC when I remeber feeling the engine power fadeing pretty quickly. What is melting point of steel? Iron? 650+ is the conservative figure I recall from ages ago, when this was debated last. Nothing really matters other than the full throttle sustained temperatures. You need to check it over the full range of engine speeds as it varies. For instance, on my 200TDI, it is around 650 at 2000 rpm and rises to a peak of 720 C at 3000 rpm and then drops above that. There are obviously also variations depending on outside temperature and airflow through the intercooler. 720 C is the continuous limit set by Garret for the turbo. It seems to be safe for the engine, so there is nothing to worry about unless you sit well above that for long periods. Iron around 1500 C, steel around 1350. But that is not something anyone would take into account. It is set based on corrosion and strength properties at temperature. The turbine metallurgy is what is setting the limit set by Garret for the turbo. Beyond the turbo, the next issue is piston temperature and the issue is mostly with fear of locking the piston or rings in the bore if it gets too hot. There does not seem to be any engine problems at the 720 C limit. I've had engines apart after sustained use and they look fine. Also many people have run massively higher before they kill something. Put in a gauge with an alarm. Alarm goes off, back off on the throttle a bit. I assume you aren't actually running 8 bar of boost but in fact 8psi ? My 300tdi is still a work in progress. I always thought it was fairly sprightly and after a couple of years the turbo let go big time. I fitted a new one, and looked in to adjusting the pump after articles on here. First port of call was an EGT gauge. Holy cr*p! I backed off at 780degrees C and climbing. Closer inspection showed it had already had the pump played with, as there were two witnesses marks on the boost pin. Looks like they had gone for the max, with no idea what was going on. The pump has been wound back to give a max EGT of 720 with the 3.5 tonne trailer on the back on a sustained climb. I think I found a max continuous figure of 725 C but can’t for the life of me find where. As I still have some off boost smoke, I need to try to get the pump back to standard and then start again. Presently running 1.2 bar boost. I know this is about resultant EGTs but how have you achieved 1.2Bar of boost? Have you put one of those valves in the pipe to the wastegate actuator? i adjusted (shortened ?) the wastegate push rod. i'm running 0.8bar boost - correction to my first post. Thats an interesting question I'd not considered, what is the maximum operating temp of the engine? is the 720 degC as stated above published somwhere? or is that a general reference to "engines". I think possibly but only to a point? At some point doesn't the compressor become inefficient so that the intercooler can't cool sufficiently and the result is higher intake temps, lower amounts of o2 as a result and then less efficient combustion and higher EGTs? I.e. there is an optimum for each setup? I am no expert, so happy for someone else to step in...! The 720 C is the published maximum continuous operating temperature for the turbo. This number is from Garret. Land Rover has not and would not publish a figure. As far as they are concerned, you should never be adjusting anything. Regardless. 720 is perfectly safe based on real world testing. No. More boost is always more air and lower EGTs at the same fueling rates. More boost is beneficial up to a point. If you get too close to the surge line the compressor stalls and air flow drops until the pressure reduces to allow delivery again. 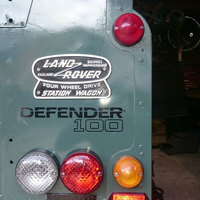 Not seen it on my Defender but on a 12,000 shaft horsepower marine diesel it certainly gets your attention! Surge on a diesel turbo? How? Without a throttle, there is no way to limit flow while at boost. I'm pretty sure you would need to mess up by using a mismatch compressor to the turbine. Typically on a marine engine it is due to operating conditions changing, for example heavily fouled scavenge spaces, damaged turbine blades etc. By increasing the boost I am operating closer to the surge line. On a turbo, though, the compressor speed is limited by the turbine choice and its map. You can only reach surge if the turbine and compressor maps are mismatched without a restriction in the system. The shaft can't spin fast enough to produce pressure and reach surge until the flow rate through the turbine is high enough. They choose the turbine and compressor on purpose to prevent any possibility of reaching surge. It is the guys that make hybrid turbos that get themselves into trouble. Just to add a bit here, after sorting out my boost gauge, i decided to tweek the exhaust gas release valve arm. I made it shorter by 2.21mm or five turns. I've now been driving the truck a few weeks and what a difference its made to the driving, very happy, it seems to have increased the boost pressure by about 0.075-0.1 bar not a huge amount but I'm not getting anything above 650deg egt, I've not tried it on the Glen Shee hill yet but its quite interesting how a subtle change has made all the difference. She's now going up hills in 5th she's never before and apparently quite effortlessly too.